Burger Theory, a gourmet burger concept offering local craft beer and build-your-own-burgers, opened Saturday, March 12. Located at 4401 East McDowell Road, off of 44th Street and McDowell, the new 3,600 square foot restaurant is adjacent to the Holiday Inn & Suites Phoenix Airport North. This modern take on the classic burger offers the highest quality ingredients including their specialty beef blend patty. Burger Theory offers unique burger options like the Lone Star that includes their signature beef, cheese, bacon, onion rings and barbeque sauce. Feeling creative? Make a burger any way you want choosing from their multiple patty options including turkey, chicken and veggie. There are no shortage of toppings including Portobello mushrooms, coleslaw and even a signature burger sauce known as Killer Good. 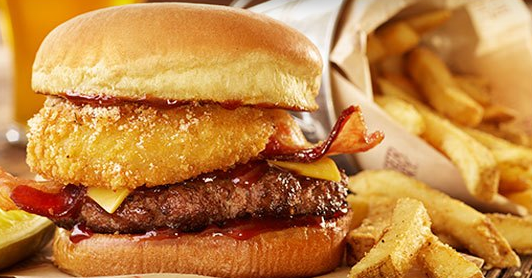 With more than 4,300 burger combinations– the mouthwatering choices are endless. This unique burger joint not only serves burgers but they also have salads, wings and signature entrees. Burger Theory will be open at 6 a.m. everyday serving your favorite breakfast items like omelets and Malted Waffles until 11 a.m. “Hoppy Hour” will also be served seven days a week from 4 p.m. – 7 p.m. offering discounted beers and appetizer specials. The concept of Burger Theory was developed by Holiday Inn and the Intercontinental Hotel Group to satisfy the dining needs of the business travelers as well as vacationing families. The casual atmosphere features rustic wood paneling and eclectic design elements such as Mason jar pendant lights, distressed wood tables and custom art pieces. There are 17 televisions broadcasting the latest sporting events for guests to enjoy throughout the restaurant and the outdoor covered patio. Founded in ­­­2014, Burger Theory is an exceptional burger concept that seeks to reinvent classic dishes by exciting your taste buds with new and fresh flavors. With over 4,300 burger options and 30 plus local craft beers, there will be no shortage of excellent dining options. Burger Theory’s fun and lively atmosphere will have you coming back for more. Visit them at burgertheoryphx.com or like their Facebook page at facebook.com/BurgerTheoryPhx. For more information you can reach them at 602-358-0924.